After two decades of democracy, do South Africans have confidence in our criminal courts? The courts require public support and institutional legitimacy if they are to function in a fair and effective manner. Benjamin Roberts, Steven Gordon, Jarè Struwig and Narnia Bohler-Muller examine public attitudes towards the courts to better understand how South Africans view this important civic institution. Are the courts doing a good job? To assess overall levels of confidence, respondents were asked: taking into account all the things the courts are expected to do, would you say they are doing a good job or a bad job? Half the South African adult population indicated that they thought the courts were doing a good job. 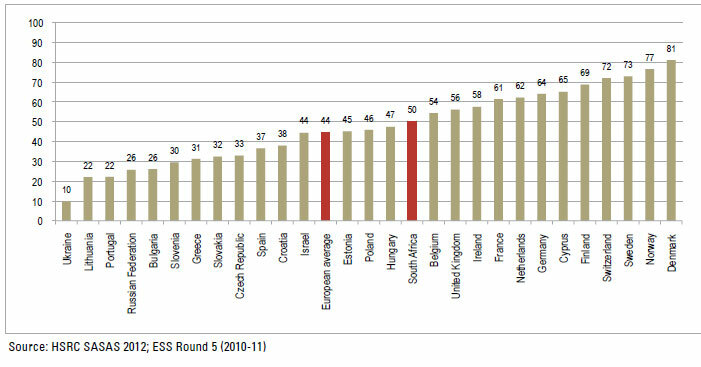 From a comparative perspective, South Africa ranks above many European states in terms of court confidence (Figure 1). Opinions across Europe vary appreciably, with the least positive views evident in Ukraine, Lithuania and Portugal, while the most positive evident in the social democratic states such as Denmark, Norway and Sweden. In this league table, South Africa is positioned alongside post-communist nations such as Hungary, Poland and Estonia, but also – more surprisingly – Belgium and the United Kingdom. 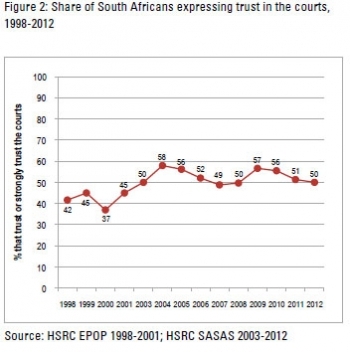 Do South Africans trust the courts? To further contextualise these findings, trend data covering a 15-year period was examined. For this purpose, responses to a standard institutional trust item that has been included annually in SASAS since 2003, as well as in earlier HSRC attitudinal surveys, was used. Respondents were asked to rate their current level of trust in the courts using a five-point scale ranging from ‘strongly trust’ to ‘strongly distrust’. As Figure 2 reveals, public perceptions of the courts demonstrated an upward trend from the late 1990s until the mid-2000s, after which confidence fluctuated within a relatively narrow range. 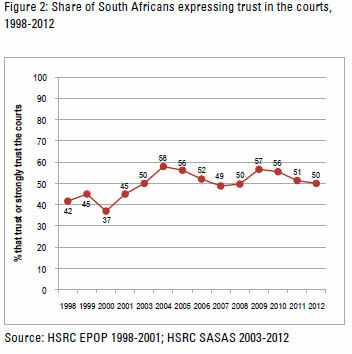 Half of all South Africans in 2012 indicated that they trusted the courts, which represented a decline from 2009 when 57% of the population trusted the courts. Evaluations of trust in the court system are said to be influenced by perceptions about court effectiveness (technical competency), as well as awareness of the manner in which the courts exercise their authority, including whether they treat people fairly, with dignity and acknowledge the rights of citizens. To assess how effective the public deemed the courts to be, respondents were asked how often they felt the courts made mistakes that let guilty people go free. Responses were measured using a 0-10 scale, with 10 representing the most negative assessment. 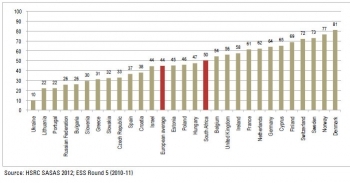 On average, adult South Africans tended to view the criminal courts as more prone to error (mean = 5.7) than Europeans on average (5.1), placing us alongside Spain, Slovakia and the Ukraine. While South Africans harbour some concerns about the effectiveness of courts, to what extent do they trust the courts to wield their authority in a procedurally fair manner in their treatment of people and decision making? Respondents were asked whether they felt that the courts made fair, impartial decisions based upon available evidence. Responses were again captured using a 0-10 scale, with 10 denoting the most positive evaluation of court impartiality. On average, adult South Africans gave responses that were above the mid-point on the scale (5.8). Cross-nationally, South Africans rated the criminal courts slightly lower than the European average (5.9), rating the country alongside Slovenia, Spain and the Czech Republic. Figure 3 demonstrates the relationship between trust in the competence of the courts and belief in their procedural fairness. The vertical axis of the chart represents the level of trust in court procedural fairness, while the horizontal axis captures perceived court effectiveness. 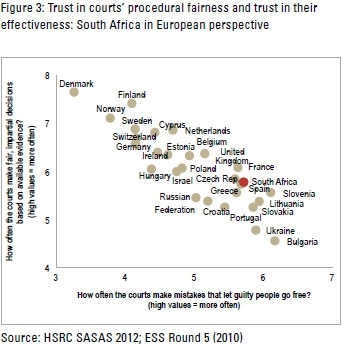 The figure convincingly shows an association between trust in judicial fairness and trust in court effectiveness, with South Africa located alongside many ex-communist states. Further analysis revealed that concerns over impartiality were keenly felt among the more marginalised and socially vulnerable in society. Poorer South Africans were less convinced of the fairness and impartiality of court decisions than the better-off and therefore, were found to be less trusting of the courts. The final component of trust in the criminal courts that was investigated was of distributive fairness, which refers to whether the courts were perceived to secure appropriate outcomes for all people and provide equal treatment that results in a fair distribution of actual outcomes. In order to measure perceptions of racial bias in the courts, respondents were asked who they felt would be most likely to be found guilty if “two people from different race or ethnic groups each appeared in court, charged with an identical crime they did not commit”. More than two-fifths (44%) reported that black South Africans were more likely to be found guilty, with 42% stating that the courts would in actual fact remain impartial. To measure perceived class bias in the courts, survey participants were asked: if two people – one rich, one poor – each appear in court, charged with an identical crime they did not commit, who do you think would be most likely to be found guilty? Approximately half (51%) of all South Africans felt that the poor person would be more likely found guilty, with less than two-fifths (38%) reporting that both would have an equal chance. 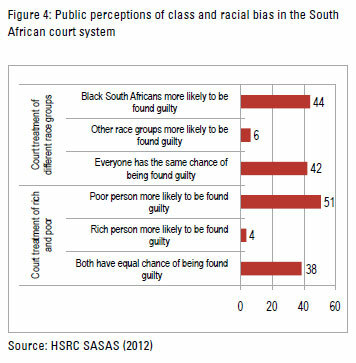 These results suggested that the majority of South Africans believed the court system discriminated on the basis of wealth and race. This belief was particularly pronounced among young South Africans. Those perceiving a race bias in court procedural outcomes also tended to believe the courts were biased against the poor. The youth, black South Africans and poorer citizens were more greatly predisposed than other groups to view the courts as distributively unfair. Those who perceived the courts as being prejudiced also tended to believe the courts were ineffective and distrusted these important institutions. The findings of the 2012 SASAS suggested that a considerable share of South Africans did not believe that the courts made fair and impartial decisions. Of particular concern were the negative views of the courts held by the young and the socially disadvantaged, since these groups constitute a disproportionately large share of the population. Their characterisation of the criminal courts as prejudiced could have a damaging effect on the legitimacy of the courts. In a context of already middling to poor levels of overall confidence and effectiveness of the courts, this leaves little room for complacency. As important institutions in any liberal democracy, the courts and their representatives need to place a strong and unwavering emphasis on performing their responsibilities in an effective and fair manner. It is only by doing so that they will inspire among the public, a sense of obligation and moral alignment, and a willingness to cooperate and comply with the rule of law. This publication was supported by a grant from the Society Foundation for South Africa (OSF-SA) (Grant number 03027). Authors: Benjamin Roberts and Jarè Struwig, coordinators of the South African Social Attitudes Survey (SASAS), Steven Gordon, PhD intern, Narnia Bohler-Muller, Deputy Executive Director, Democracy, Governance and Service Delivery programme, HSRC.